Munich - As one of only two teams to have taken points off FC Bayern München in the Bundesliga this season, SC Freiburg will be in the path of a tornado when the two sides meet in the Allianz Arena on Matchday 21 this Saturday (kick-off 15.30 CET). Freiburg nicked a late draw against the Bavarians back on Matchday 4, something only Bayer 04 Leverkusen have managed since. In the weeks and months that have followed, Bayern have raced clear at the top of the table, extending their unbeaten league run to 45 games, and victory here would be their 13th on the trot in the Bundesliga. 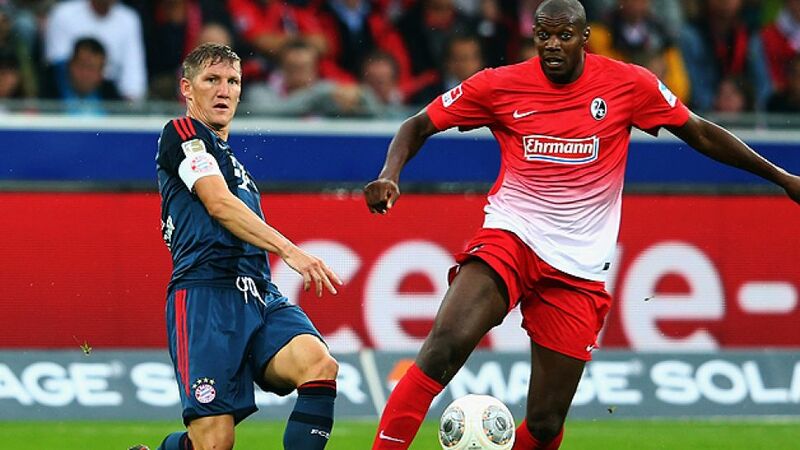 Bayern also boast a 13-point advantage over second-placed Leverkusen following last week’s Bavarian derby win at 1. FC Nürnberg and will have been further boosted by a of Hamburger SV in midweek that took them to the semi-finals of the DFB Cup. helped himself to a hat-trick in the Imtech Arena, while and also featured as they continue their respective returns to fitness. "Bastian is an outstanding player, and he played very well against Hamburg, although he still needs a few more games," said FCB coach Pep Guardiola in his pre-match press conference. "The fans' reaction showed us how important he is for the team." His counterpart Christian Streich had alleged in his pre-match press conference that Bayern's players would have fun playing at home to 15th-placed Freiburg, but Guardiola's attitude was anything but light-hearted. "It's not about having fun, it's about hard work," the 42-year-old responded. "They're an aggressive team that plays in a way that reflects their manager's personality." Huge underdogs SCF top goalscorer and Co may be, there remains hope for Freiburg, largely because of the man they have at the helm. Since taking over as coach in December 2011, Streich has instilled a belief in the players that has seen them perform consistently as a team that is so much more than the sum of its parts, surviving relegation in 2011/12 and qualifying for the UEFA Europa League in 2012/13. So far in 2014, without the burden of midweek European fixtures, the Black Forest club have picked up , and while the odds may be stacked against them in Munich, fans would do well to remember that the two solitary points they have taken in their last sixteen meetings with Bayern have both come under Streich.